Is anyone else as excited for fall as I am? It is my favorite time of the year - cooler temperatures, leaves changing, pumpkin festivals, fall food, Halloween, the MLB playoffs and World Series, and football! Jon goes out to watch his favorite team, the Buffalo Bills, at a local bar every Sunday. Before we had our daughter, I would spend all day Sunday in the kitchen prepping food for the week, making soup, and making a hearty Sunday dinner. It's a little harder to do that now, but I still love doing some good cooking on Sundays, and little by little am trying to get our little one more involved. Last Sunday I decided to try a crock-pot recipe since we had our neighborhood block party that afternoon. I starred this recipe for Balsamic Braised Chicken with Swiss Chard from Kelsey's blog several months ago and it sounded perfect for a Sunday dinner. I liked this dish. The sauce was tangy and the chicken took on so much flavor. I wasn't a fan of the Swiss chard, however (it was the first time I ever had it!) - it seemed to taste like beets and I was totally expecting a different flavor. The changes I made included seasoning the chicken with salt and pepper and searing them quickly before putting them into the crock-pot. I also only used 3 chicken breasts. Additionally, I used 1 tbsp of Worcestershire instead of the anchovy. The original recipe is below. Heat oil in 12-in. skillet (or super sweet slow cooker!) over medium-high heat until shimmering. Add onion, thyme, tomato paste, garlic, anchovy, and red pepper flakes and cook until onion is softened and slightly brown, 8-10 minutes. Stir in flour and cook 1 minute more. Slowly whisk in vinegar, scraping up any browned bits and smoothing out any lumps. Cook until slightly reduced, about 3 minutes. Transfer to slow cooker. Stir tomatoes, broth, wine, and bay leaves into slow cooker. Season chicken with salt and pepper and nestle into slow cooker. Cover and cook until chicken is tender, 4-6 hours, on low. Gently stir in chard, cover, and cook on high until tender, 20-30 minutes. Transfer chicken to platter and tent loosely with foil. 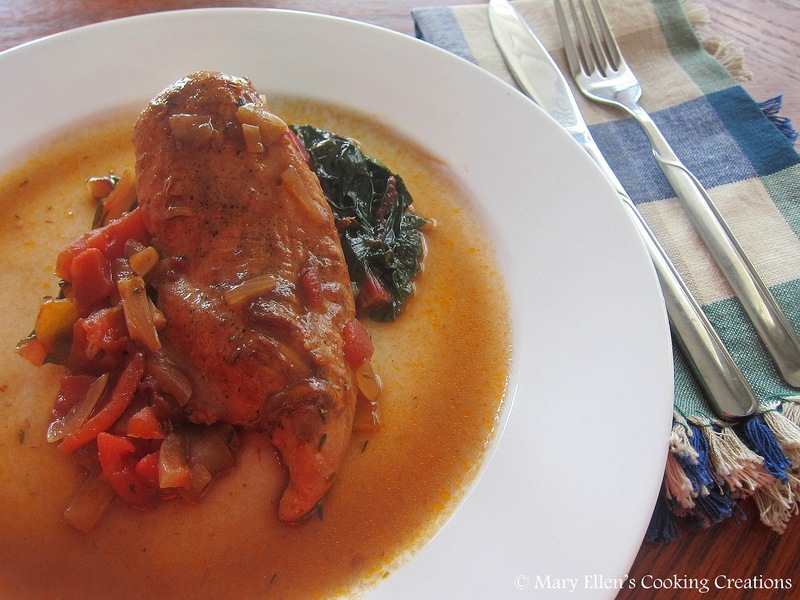 Let braising liquid settle 5 minutes, then skim fat from surface using large spoon. Discard bay leaves. Season with salt and pepper to taste. Serve with sauce spooned over each chicken piece. Serves 6-8.